FYI: Inspired to create space where modern worshippers can connect with historic worship texts, Jars of Clay convened in the studio to construct an intersection where the traditional and unconventional meet. Guests on the project include Grammy Award-winning legends Blind Boys of Alabama, the renowned modern worship songwriter Martin Smith (Delirious) and Grammy-nominated new artist Sarah Kelly. 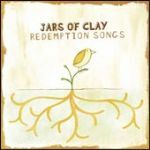 Bottom Line: Jars of Clay isn’t merely jumping on the worship bandwagon with this disc, they’re driving it! True to form, the band has emerged from the studio with a highly unique musical statement, employing a mix of unusual instruments including pedal steel, mandolin and fiddle. The overall feel is fresh and organic, yet the tunes are driven by the rhythms that are common on their previous gold and platinum-selling albums. Perhaps best of all, the project is rife with the profoundly rich theology that has often gotten lost in more contemporary worship texts. A home run on all levels, Redemption Songsis likely to go down as one of the band’s most original, engaging recordings to date. Listen to sample from Redemption Songs or buy now from Songs4Worship.com!